Never before will you have seen something so completely out of continuity, and yet so thoroughly enjoyable, as Superman/Batman: The Enemies Among Us. I approached this fifth volume of Superman/Batman with much trepidation, as it's the first volume not to be penned by Jeph Loeb. Though writer Mark Verheiden's Superman seemed slow and overemotional (perhaps due to mandatory tie-ins to Infinite Crisis), his Superman/Batman story is a delightful (and intentional) throwback to the Silver Age, full of dozens of DC's most wacky and wild alien concepts. If you can throw your continuity censors out the door, Enemies Among Us is a worthwhile ride. Superman and Batman are attacked by a shape-shifter that takes the shape of the Martian Manhunter, Titanto, and the Parasite, among others. When they're attacked by Green Lanterns, however, Superman begins to be controlled by an alien presence. Batman is recruited by Lex Luthor to work with Plastic Man, ultimately retrieving the Blackrock from the Fortress of Solitude. Superman regains control in time to free Batman from the Blackrock and save the world from an old alien enemy. 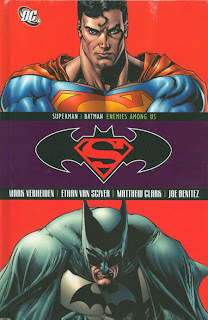 Enemies Among Us is deceptively a Superman/Batman story. The story is narrated by Alfred, giving it already a greater Batman bend, and indeed a great part of the beginning of the story deals with Batman considering how to save Superman; given Plastic Man and Hal Jordan's roles, this could almost be a JLA story. In the second half, however, Verheiden offers the twist of Superman having to save Batman from his own plan, and the end brings together the two heroes fighting together. If Superman/Batman: Supergirl skewed a little Superman-heavy, Enemies Among Us is a fair response. Throughout Enemies Among Us, Verheiden plays fast and loose with DC Comics continuity. Characters recall meetings that never happened, or only happened post-Crisis on Infinite Earths, like Superman fighting a Kryptonite-infused Titano; the Golden Age Lois Lane even, inexplicably, makes an appearance. There are modern notes -- the Toyman who's been recently featured in Superman/Batman gets a mention, and Martian Manhunter appears in his new costume -- but even these don't always work, as Lex Luthor seems devoutly pre-Infinite Crisis, and the idea that Batman needs to revitalize his friendship with Superman comes one crossover too late. Verheiden offers a nice afterword that suggests many of these things were intentional; if you're ready to accept that the Wonder-Woman-in-the-League Silver Age now indeed happened in modern DCU continuity, Enemies Among Us uses that concept well. Jeph Loeb defined the Superman/Batman title with summer blockbuster, widescreen action, full of DCU cameos and esoteric World's Finest concepts like the Composite Superman/Batman. Verheiden upholds this, and the final alien invasion scenes are a Who's Who treat. I'm glad to see Verheiden's got one more Superman/Batman storyline after this one, and I'll be looking forward to it. By the way, see writer Mark Verheiden's blog here. Stay tuned for more! Though I've grown tired of Loeb's tedious caption writing I'm looking forward to reading Vengeance in softcover to see McGuinness' return to the title. However I was planning to skip Enemies Among Us since I didn't like the look of Ethan van Sciver's artwork when I flipped through the floppies. But I think your review will compell me to pick it up with it comes out in trade format. But I'm most looking forward to the current arc being collected solely because of Dustin Nguyen's art because I loved his work on Batman: As the Crow Flies. Thanks, Nobody! That's high praise indeed! Let me know how you enjoy the trade. Friday Night Fights: One (Sucker) Punch! What did Judd Winick do wrong? Friday Night Fights - Mongul Smash!